In advance of a workshop I'll be teaching next week at the Universidad Nacional del Comahue in (reputedly) beautiful Bariloche, Argentina, I will be trying to get a new version of phytools on CRAN. This update will have version number >=0.5.62 (TBD). A bug fix in collapseTree. 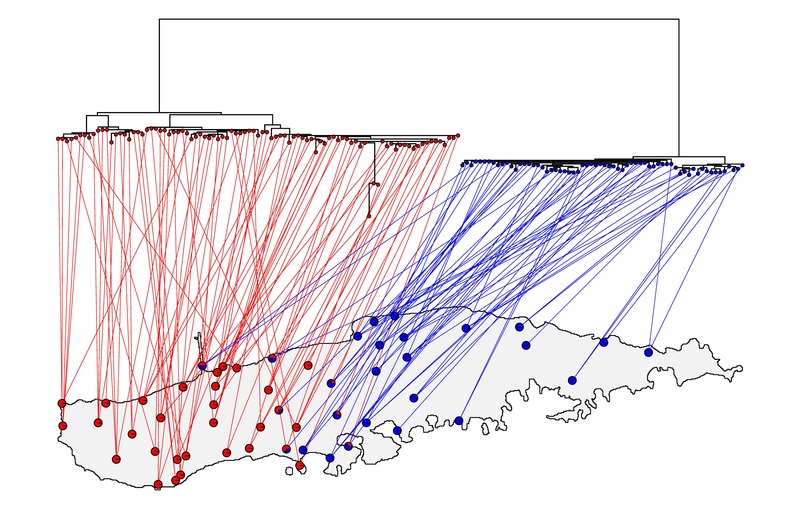 More user control of the plot method for phylo.toBackbone (here). Another update to backbonePhylo to permit multiple clades to have the same label. A new phytools function for showing a barplot next to a plotted tree, plotTree.barplot (1, 2, 3). A new function, related to plotTree.barplot, to plot a boxplot next to a phylogeny (plotTree.boxplot). Also see this addition permitting the boxplot to be build using the ‘formula’ method. A simple update to phyl.pca to permit more columns than rows in the input data matrix. Update to plot.cophylo to permit sigmoidal linking lines. Function to reorder the daughter edges of a multifurcation in all possible ways. New option to rotate polytomies for co-phylogenetic plotting using the algorithm developed for [10.] (here). Speed up & fixes for collapseTree. New option to get the variance and confidence intervals for reconstructed tip states obtained using anc.ML. New function to plot the likelihood surface for the phytools function rateshift. Update to the function add.color.bar to permit the gradient color legend to be plotted vertically as well as horizontally. Additional user control of the S3 plot method for objects of class "cophylo". Updates to tip label plotting and a new S3 summary method for "cophylo" class objects. A new phytools function to find all possible node rotations of all nodes in a tree. A new exhaustive search for the cophylo function for co-phylogenetic plotting. Some updates to fitMk to permit more user control of optimization. A small fix to pass optional arguments to fitMk within make.simmap. A bug fix for add.color.bar. A very simple new cospeciation test in phytools. A function to compute a modified version of Grafen’s edge lengths. A cool S3 density method for objects of class "multiSimmap". Some new methods and user-control of phylogenetic scattergram plotting using fancyTree. Some updates to permit more user control of line end types in plotSimmap. An extremely simple function (bd) to pull birth & death (species & extinction) rates from an object of class "birthdeath" computed by ape. A simple new function and print method to compute AIC weights. And, finally, a bunch of other miscellaneous updates to address issues raised when updating ape & phangorn. I know this isn't comprehensive, but it is a survey reflecting the wide range of updates & changes to the package. Of course, now that phytools is on GitHub, it's super easy to track all the committed changes the package has seen. I'll post again when the updated phytools makes it on CRAN!